Publisher’s summary: About to be executed for murder, Yelena is offered an extraordinary reprieve. She'll eat the best meals, have rooms in the palace—and risk assassination by anyone trying to kill the Commander of Ixia. As Yelena tries to escape her new dilemma, disasters keep mounting. Rebels plot to seize Ixia and Yelena develops magical powers she can't control. Her life is threatened again and choices must be made. But this time the outcomes aren't so clear…. My Take: The first time I heard about this book was from Jaime (Two Chicks on Books), and it was Jaime who finally got me to read Poison Study by literally putting the book into my actual hands! And I am so happy that she introduced me to this series. This is ultimately a brilliant book in so many ways that I will have a hard time explaining all my feelings about it. Poison Study starts off pretty strange, but everything that happens from the first page had me captivated. The book starts out with Yelena walking resolutely to her sentencing, to be executed for a murder she committed. But at the last minute, Valek (the Commander’s right-hand man), offer’s Yelena a cruel and drastic way to have her sentence commuted. Immediately and from the very beginning, I did not like Valek! I felt like he was evil and manipulative. But the further along I got into the book, I found myself in absolute awe over how smart he was. Manipulative is an understatement! And then I started to wonder if he even really was a bad guy! There are some crazy betrayals, and a couple of characters that I thought in the beginning were bad guys end up being some of my favorite characters in the book. There are so many awesome twists and turns in this book that I’m now fascinated by Maria V. Snyder’s imagination! 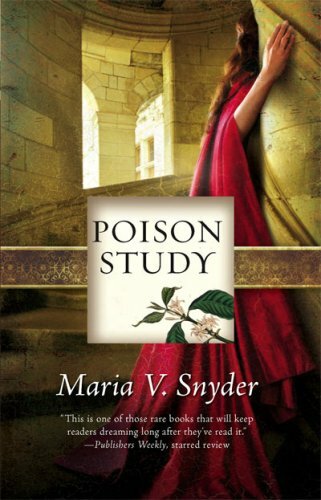 Poison Study was a lot of fun to read, and I’m more than a little excited to start reading Magic Study! Glad to hear you liked it. This was the first book of hers I've read and I really enjoyed it. You should read Touch of Power. It was a little similar but just as good. I haven't really heard much about this book, but it sounds good. Valek sounds like a really interesting character. Awesome review chick!! This is one of my favorite books of all-time-I love it so much! I second Kristin's recommendation of Touch of Power, which is very similar but different. I absolutely loved this series, I am so glad you are reading them too! Don't forget to check out the novellas too, they are just as good! This is one of my favorite books! I love how she made me dislike Valek at the beginning and like him by the end... her stories are so twisty.